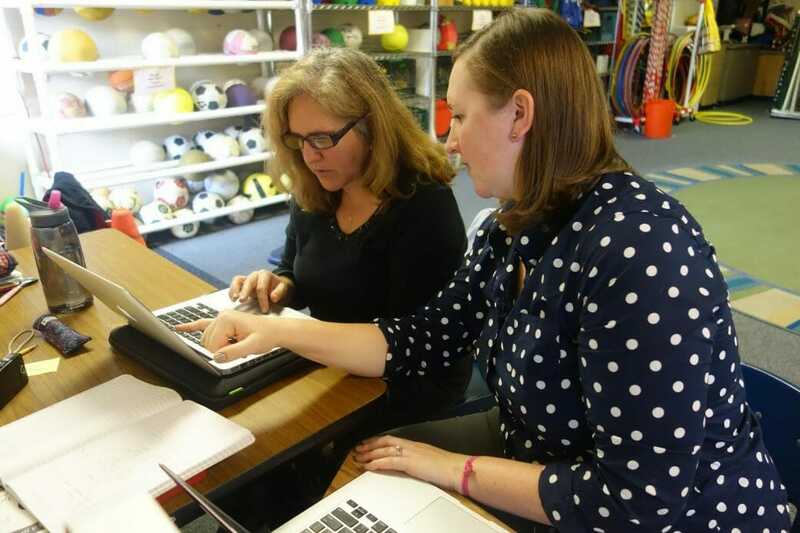 It’s hard to believe that Kate Sprague, Mill Valley School District’s new technology coach, has only been in action for about a year now. Because if you ask her, her days are sometimes only slightly less frantic than those of that explorer who’s trying to get away from those demonic apes in that Temple Run game your kids like to play on your smart phones. An example of Sprague’s expertise is at work on a recent afternoon in Lori Adessa’s classroom at Tam Valley. When most Mill Valley School District parents think of Lori Adessa – Mrs. Adessa to the kids – they think of her catchy Halloween bobbing-for-apples song. They think of her deftly strumming her guitar and leading their children as they sing in French, curtsy and bow, and trill about a bridge in Avignon. What they most certainly don’t think of is the “student” Mrs. Adessa who has come this day, guitar and MacBook Pro in hand, to enlist the help of Sprague, a 2004 graduate of the University of Puget Sound. Sitting in front of a MacBook Pro, Adessa explains to Sprague her simple desire: To use the new, district-provided programs on her MacBook Pro to create her teacher web page and to separate all her classes by grade, to post pictures and to provide links to video and lyrics and performances. Adessa cuts to the chase. “I was like, ‘How do I do this?,'” she says to Sprague, talking with hands to express her eagerness to learn. Sprague is exactly the person to right Adessa’s listing technological ship. Hired last summer as part of the District’s technology strategic plan and funded entirely by Kiddo!, Sprague’s primary focus is to assist classroom teachers to successfully integrate instructional strategies using multiple technologies… kind of like the school district’s personal, mobile Genius Bar. A teacher needs help converting a video on a camera into a link on a home page? Call Kate. A teacher is planning to create a movie with a third grade class on the history of the Coast Miwoks? Call Kate. A principal needs help planning tech training for the staff? Call Kate. A teacher needs to figure out Google calendar and Google apps to help organize and schedule field trips and room usage? Call Kate. Sprague is in the sweet spot of the desired demographic for such a technological position. Born to parents who embraced technology and had Compaq and Apple IIe computers in the house, Sprague remembers programs on floppy disks, torturous dialup connections, hotmail email addresses and direct messaging through ICQ. That’s a fact. While Kiddo! funds technology support specialists like Sprague, it also helps to fund the lease-to-own contracts of laptop computers for the district. The benefits reaped from such copious resources are easily seen. Whether it’s a first grader bringing home XtraMath to practice addition on an iPad, or an Edna Maguire third grade teacher making a documentary with the students using iMovie, it’s all invigorating to a tech-head like Sprague. Even the tedious stuff is fun, she insists, as she lists her top requests of late: Google Drive training, website building assistance and personal help with classroom devices like Apple TVs or projectors. The only problem according to Sprague? “There’s so many of them, and only one of me,” she says. Meanwhile, back in that Tam Valley classroom, Adessa is pointing and clicking on pictures from a Kindergarten performance that she’s trying to have go live on her teacher web page. Pausing mid-picture-selection, Adessa says having Sprague on board is way better than recent history’s alternative.